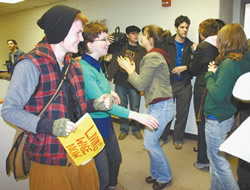 Campaign background: The United Students Against Sweatshops affiliated group started on Western Michigan's campus in the spring of 2004. They started in response to their university privatizing half of the janitorial workforce who had previously been made up of members of the on-campus union, AFSCME local 1668. Contracting (privatization) is the common practice of having work performed by an outside contractor rather than by directly-hired employees. There is a trend of universities contracting out labor to cut costs and evade responsibility for the treatment of the workers. Contracted campus workers are almost always paid significantly less than directly-hired workers. It seems that WMich has plans to continue this privatization all over campus. The students, workers and the union are demanding that the university pay the newly subcontracted workers a living wage as well as ensure that the workers are receiving other extremely important non-wage benefits.